The June 1 PTSA Meeting has been rescheduled to Wednesday, June 7 at 6 pm in the Principal’s Conference Room. https://wjccschools.org/lhs/wp-content/uploads/sites/20/2017/10/Lafayette-High-School.png 0 0 Monica Schauffler https://wjccschools.org/lhs/wp-content/uploads/sites/20/2017/10/Lafayette-High-School.png Monica Schauffler2017-05-31 07:37:442017-05-31 07:37:44The June 1 PTSA Meeting has been rescheduled to Wednesday, June 7 at 6 pm in the Principal's Conference Room. Current and former German students – our last German Club Meeting is today after school from 2:30-3:30 in room 628. All current and former students are welcome to join in for cake, snacks, beverages. German National Honor Society – our last official meeting is today after school from 2:30-3:30 in room 628. This meeting is mandatory for all GNHS members. The LHS Variety Show is Friday, June 2nd from 7:00-9:00 pm in the auditorium. Come and enjoy the show that features the talents of LHS students who sing, dance, rap, and everything in between. Students are only $3.00, all others are $5.00. Seniors: Friday, June 2nd is Senior t-shirt day. Wear your t-shirt and earn prizes! The Love is Love Club will be holding a fundraiser this Saturday, June 3rd from 9:00 am – 12:00 pm. It will be a car wash and a show, so come and enjoy some entertainment from our students as we wash your car. Tickets are $5.00 and are available for purchase from Mr. Bellido or any club member. Cheerleader tryouts are today and tomorrow from 5:30-7:00 pm and Thursday, June 1st 5:30-8:00 pm in the LHS gym. You must have a VHSL sports physical dated after May 1, 2017 prior to tryouts. Bring current physical to participate in tryouts. Current and former German students – we will have our last German Club Meeting after school from 2:30-3:30 on Wednesday, May 31st in room 628. All current and former students are welcome to join in for cake, snacks, beverages. German National Honor Society – our last official meeting will be on Wednesday, May 31st after school from 2:30-3:30 in room 628. This meeting is mandatory for all GNHS members. The LHS Variety Show is Friday, June 2nd from 7:00-9:00 pm in the auditorium. Come and enjoy the show that features the talents of LHS students who sing, dance, rap, and everything in between. Students are only $3.00, and all others are $5.00. Congratulations to the new French Honor Society inductees! 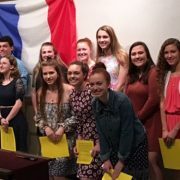 Fifteen new inductees from French 3 and French 4 were honored in a ceremony last Wednesday. They were joined by current members, including six graduating seniors, in a reception that followed the induction ceremony. Félicitations à nos savants Français! Cheerleader tryouts – Tuesday, May 30th and Wednesday, May 31st at 5:30-7:00 pm, and Thursday, June 1st at 5:30-8:00 pm in the LHS gym. You must have a VHSL sports physical dated after May 1, 2017 prior to tryouts. Bring current physical to participate in tryouts. German National Honor Society members – our last official meeting will be on Wednesday, May 31st after school from 2:30-3:30 in room 628. This meeting is mandatory for all GNHS members. Juniors: There is a meeting during AEP today for any rising Senior interested in the W&M Science internships this summer. The meeting will be in room 310. Please see Mrs. Shaver in Guidance or Mrs. Milligan in 310 if you have any questions. Cheerleader tryouts – Tuesday, May 30th and Wednesday, May 31st 5:30-7:00 pm and Thursday, June 1st 5:30-8:00 pm in the LHS gym. You must have a VHSL sports physical dated after May 1, 2017 prior to tryouts. Bring current physical to participate in tryouts. 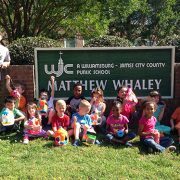 Ms. Consoli’s AP Government class designed and implemented a civics project in collaboration with Mrs. Armbruster’s kindergarten class at Matthew Whaley Elementary School. The high school volunteers showed the youngsters how to make bird feeders from recycled milk cartons. Pictured are Lafayette high school seniors Mikhail Johnson, Konrad Steck, and John Barton and Mrs. Armbruster’s kindergarten class. The VASTAR computer refurbishment group will meet today in room 104 immediately after school. If you have any questions please see Mr. Aadahl in room 104. Juniors: There is a meeting during AEP on Thursday, May 25th for any rising Senior interested in the W&M Science internships this summer. The meeting will be in room 310. Please see Mrs. Shaver in Guidance or Mrs. Milligan in 310 if you have any questions. Cheerleader tryouts: Tuesday, May 30th and Wednesday, May 31st 5:30-7:00 pm and Thursday, June 1st 5:30-8:00 pm in the LHS gym. You must have a VHSL sports physical dated after May 1, 2017 prior to tryouts. Bring current physical to participate in tryouts. The VASTAR computer refurbishment group will meet Wednesday, May 24th in room 104 immediately after school. If you have any questions please see Mr. Aadahl in room 104.